The advantages of running Enterprise Continuous Integration (CI) processes are well documented - improved time-to-market and quality are just the top of the list. Implementing CI across the enterprise appears to require more build infrastructure than many IT organizations can sustain and a large build cloud puts a large performance load on the SCM system. 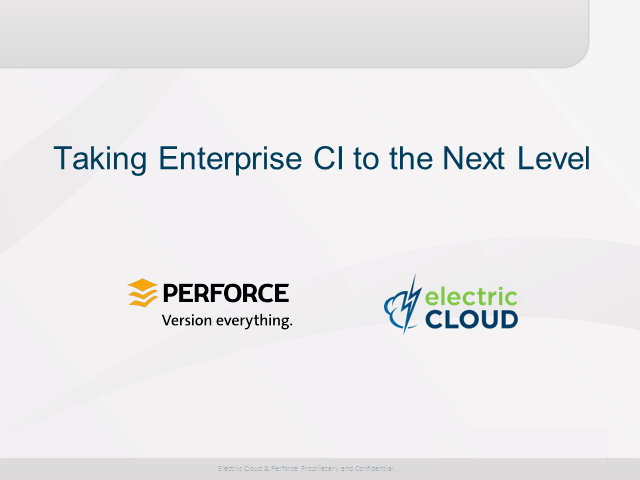 Both Electric Cloud and Perforce provide unique technology to implement Enterprise CI while addressing critical challenges through key advantages such as preflight build support and source repository replication. Join this webinar to learn how Perforce's investment in replication technology will help sustain an enterprise build cloud with little impact on the rest of the system. Perforce's 2012.1 release features a new replication behavior targeted at build cloud support, another step forward in Perforce's federated architecture. You’ll also learn how ElectricCommander 4.1 and the latest release of the ElectricCommander plugin for Perforce dramatically improve Enterprise CI adoption and preflight build performance.